Ah I remember it well. Portugal 2008. We'd been to the Southern coast with my friend Alison and then travelled up to stay with my brother who lives in Lisbon. There was a sweet, gentle, tender wind that cooled the hot sun. It seemed to whisper that life could be so lovely, full of potential, full of possibilities. It is true; but it was also a lie. Was it the calm before the storm? Was I being given one last sip of a nice, simple life? Not sure, but I look back wistfully on a perfect holiday; on a perfect life. Chloe was 13 and Hannah 16. Cancer hadn't touched us then. I was happy. Of course I didn't know it and I still greedily hungered for more. Just didn't realise that there isn't more; never was, never is and never will be. A healthy family on holiday - that's as good as it ever gets. If only I'd known. 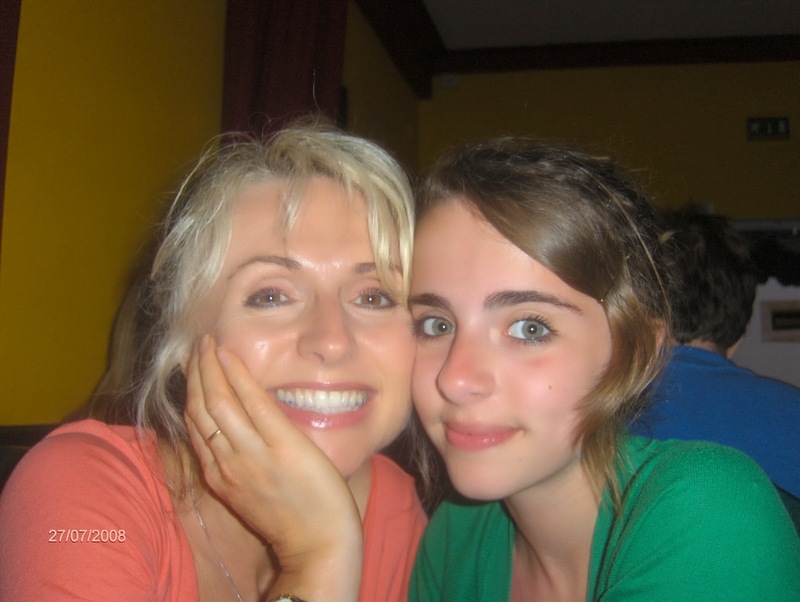 And now my eyes rest on all I have left - a picture of those beautiful green eyes, the thick black eyebrows that she hated and once shaved completely off (Chloe never did things by half) those lovely cheekbones, both my girls inherited these from my beautiful Irish Mother, and that sweet smile. But more than all of that I see my baby daughter's spirit - so fierce, so intense and so ready for life. My Chloe was never an easy child; neither of my daughter's were/are. There was a wild Irish-ness to Chloe; and there still is with Hannah. I don't think I breed easy children. But boy was she wonderful. Passionate, complicated and a little bit mad. Emotions would whirl around the house with Chloe - you'd never be in any doubt that she was there. Screaming about her domestic injustice one moment (having to tidy her room), fighting her sister and Simon and whoever else happened to be in her way the next and then squeezing up next to me on the sofa saying matter of factly "Mum your nose looks like a triangle; but I really love you". There was a fire in her that made her fascinating to watch and then a slightly other worldliness that held an irresistible magnetism. She really was a glorious child and I was a lucky lucky Mother to have her. God she's left a bottomless hole of grief in all of our lives. So seven months on and life has moved on and the grief has moved from that physical gnawing pain that leaves you huddled foetal like on the floor - howling like a seriously wounded animal. It really is that bad. For me, at least, the hard edges of the pain have softened a little and this makes life a tiny bit easier to endure. But I know for sure that I will never be nearly the same again; but nor do I want to be. My soul and heart have been through the equivalent of a head on collision and the scars are deep and lasting. Spiritually I've moved into a kind of other world; a world where I feel more detached, a little more comfortable maybe, a World where only love and kindness matter to me now. How arrogant of me to say I'm a better person for all of this; but I feel like a better person and that's just my truth. And the good thing is what is left from the wreckage is a stronger ability to love and to try and live in the present. The future, with first anniversaries looming is far far too painful to even contemplate. I love deeply, madly, wholeheartedly. I love my beautiful angel in heaven even more than I loved her on earth. I love and feel the most intense gratitude that I have another wonderful daughter and that she has given us all the best Grandson in the whole world. I love my dear husband, my rock. And I love, already, the little baby Granddaughter who will be joining us at Christmas. And I love my dear friends who have walked with me and still remain steadfastly by my side and in my heart. I would do absolutely anything for every single friend I have. They are so precious. I've cleaned out my friendship drawer and those remaining will be with me for life. Of that I'm absolutely sure. Human beings really can be the most wonderful things. And anyhow I ignore the ones who aren't - they are kept firmly out to my life nowadays. No time for that. Another positive change I feel. Andi's Army - people power yipee!! !